The seashore earwig Anisolabis littorea, photographed in captivity by Fredrik Haljesgard (haljeszoo at yahoo.se). 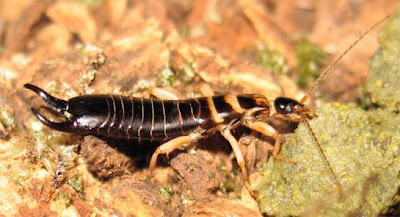 Dating back to the late Jurassic or early Cretaceous, the Neodermaptera are the crown group of the earwigs. They are readily distinguished from other living insects by the cerci being modified into a large pair of forceps at the end of the abdomen; they also have the front wings modified into a small pair of hardened tegmina under which the hind wings are folded when not in use. See also: Wigs and wings and other things. Characters (from Grimaldi & Engel 2005): Ocelli absent; tegmina without veins; ovipositor reduced; tarsi with three segments. [B14] Burr, M. 1914. Les Dermaptères de la Nouvelle-Calédonie et des îles Loyalty. In Nova Caledonia: Forschungen in Neu-Caledonian und auf den Loyalty-Inseln. A. Zoologie vol. 1, Heft IV (F. Sarasin & J. Roux, eds) pp. 315-324, pl. 9. C. W. Kreidels Verlag: Wiesbaden. [NW03] Nel, A., A. Waller, V. Albouy, J.-J. Menier & G. de Ploëg. 2003. New fossil earwigs from the lowermost Eocene amber of Paris Basin (France) (Insecta, Dermaptera, family incertae sedis). Geodiversitas 25 (1): 119-129. [O81] O'Brien, C. O. 1981. A. A. Book of New Zealand Wildlife: A guide to the native and introduced animals of New Zealand. Lansdowne Press: Auckland. [S02] Shcherbakov, D. E. 2002. Order Forficulida Latreille, 1810. The earwigs and protelytropterans (=Dermaptera DeGeer, 1773 +Protelytroptera Tillyard, 1931). In History of Insects (A. P. Rasnitsyn & D. L. J. Quicke, eds) pp. 288-291. Kluwer Academic Publishers: Dordrecht.